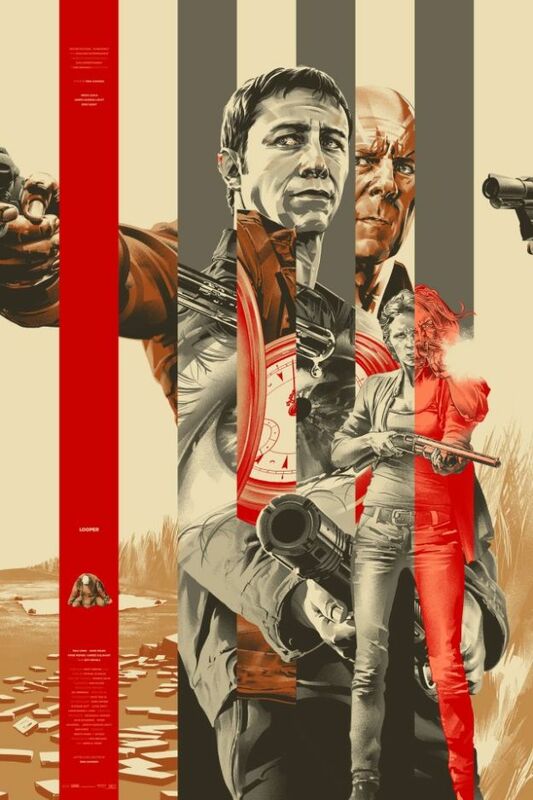 The good news is there are two different Mondo posters for the upcoming Looper. The bad news is that it will only be available at a special screening of the film in Austin, Texas at the 2012 Fantastic Fest on Friday, September 21st. But you can take a look at both of the posters below via the Official Looper Facebook and The Huffington Post. Written and directed by Rian Johnson, the film stars Bruce Willis, Joseph Gordon-Levitt, Emily Blunt, Paul Dano, Noah Segan, Piper Perabo and Jeff Daniels. In the September 28 release, time travel will be invented – but it will be illegal and only available on the black market. When the mob wants to get rid of someone, they will send their target 30 years into the past, where a “looper” – a hired gun, like Joe (Joseph Gordon-Levitt) – is waiting to mop up. Joe is getting rich and life is good… until the day the mob decides to “close the loop,” sending back Joe’s future self (Bruce Willis) for assassination.